Popcorn movies like The Meg, in which a giant shark terrorizes people at an ocean research facility, used to be a lot more fun. Those older movies were also silly, of course, but they had a sort of careless charm. I’m thinking of flicks like Deep Blue Sea. These days, popcorn movies seem weighed down by conscientiousness. 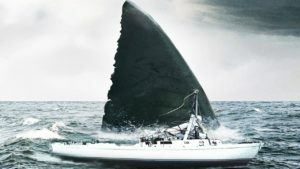 Does The Meg have a diverse cast? Check. Does it have Chinese stars to please the all-important Asian market? Check. Are there pricey special effects? You got it.